The 10 Best Bakeries in North Dakota! Looking for a doughnut that will send your sweet tooth into a frenzy? Looking to snack on some fresh, warm bread that will delight your taste buds? We’ve got all that and more in North Dakota. Here are our 15 favorite bakeries in the state. If you have a sweet tooth and are visiting Fargo, a stop by Nichole’s is in order. Specializing in elegant creations, Nichole’s uses ingredients that are produced locally, giving the pastry shop an authentically North Dakota feel. Offering everything from cheesecakes and specialty pastries to truffles, mousse cakes, and tarts, Nichole’s caters to diners with a sophisticated pallet. The pastry shop also serves a full lunch menu that features sandwiches, quiche, salads, and egg bake. Finally, Nichole’s is a fervent supporter of the arts and the work of local artists frequently dons the walls. GiGi’s cupcakes are baked fresh daily, providing diners with over 30 different varieties. The bakery also specializes in cheesecakes, with flavors ranging from cherry to chocolate-chocolate chip. Seasonal cheesecakes are also served and if you are visiting Fargo in the fall, you must try GiGi’s pumpkin cheesecake. For those with a gluten-free diet, do not fear. GiGi’s provides a full line of products to fit your dietary needs without sacrificing flavor. If you have never had a Captain Crunch covered donut, you have no idea what you are missing. Paradise Donuts specializes in donuts that feature out-of-this-world flavor combinations. Whether you are interested in cake, filled, large, or specialty donuts, Paradise has you covered. Where else can you indulge in a Fruity Pebbles or peanut butter cup doughnut or splurge on a home-made bear claw, maple bacon long john, or caramel apple fritter? If you can dream it up, Paradise can, and probably does, make it. The bakery also serves breakfast (think biscuits and gravy or a delectable breakfast burrito) or lunch, featuring build your own sandwiches. A family-owned bakery, GoGo specializes in freshly ground coffee and home-made baked goods. Their coffee is ground each morning, ensuring a smooth and delicious cup every time. There’s also no day-old goods at GoGo. Each doughnut is made the morning you bite into it… it doesn’t get any fresher than that. Whether you are interested in a mouth-watering caramel roll, filled croissant, or fritter or are looking for a delicious cup of soup or sandwich, GoGo is a must stop. Another locally-owned family business, Bearscat Bakehouse offers over 50 different kinds of donuts on a daily basis. In addition to traditional baked goods, Bearscat features specialty goods and creative combinations such as the Tango Mango, which is a mango filled donut topped with Tang, or the Elvis, a banana filled, peanut butter iced donut with bacon and chocolate drizzle. The term Bearscat is an old cowboy terms for donut, and Bearscat Bakehouse is all about authenticity. Hungry for a Scotcharoo, a butterscotch filled donut with chocolate icing and peanut butter drizzle? Bearscat Bakehouse is for you. If you are looking for fresh, stone-ground whole wheat bread products, Bread Poets is the place to be. The wheat is milled daily at Bread Poet’s own Stone Burr Mill and that is as fresh as it gets. 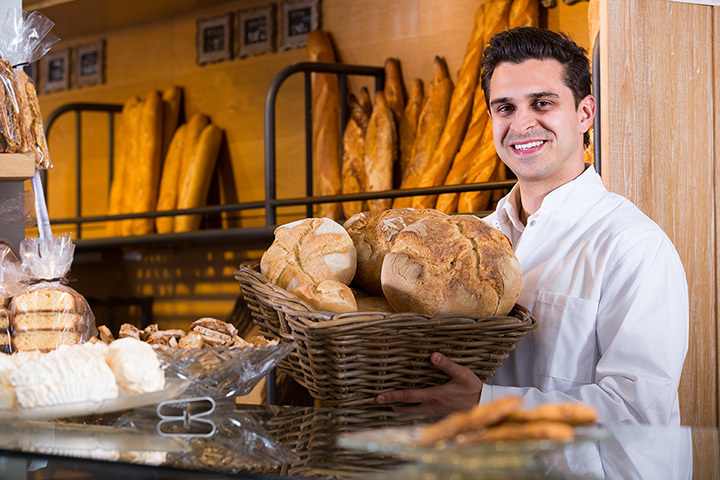 The bakery is dedicated to providing you with bread finished the old-fashioned way and is committed to offering the freshest bread anywhere. All breads that aren’t sold within 30 hours of being baked are donated to local homeless shelters. To stay true to its North Dakota roots, Bread Poets uses only high protein north Great Plains wheat. Kaity Kakes specializes in wedding, party, and specialty items including cupcakes, cake pops and cookies. All products are custom made to provide finished items that are truly one-of-a-kind. Although Kaity Kakes specializes in wedding cakes, no event or celebration is off limits. Another bakery that specializes in cakes, O for Heaven’s Cakes is also known for its delectable pastries and desserts. The bakery offers specialty cakes and cupcakes in a wide variety of flavors as well as cookies, bars, pies, cheesecakes, pastries, and turnovers. Gluten free and diabetic products are also available. Although the smallest bakery on the list, Michelle’s products are anything but small. The bakery is a small home-based business that specializes in made-from-scratch products, including custom cakes, cheesecakes, brownie pops, and gourmet cupcakes. Michelle’s can make unique, delectable products for any occasion. Bully Brew Coffee is equally known for its delicious cup of Joe as it is for their delicious baked goods. The bakery’s flagship items are their home-made macarons, which are available as gluten-free products. Bully Brew also specializes in breads, scones, caramel rolls, muffins, cookies, and bars. If you are interested in something more substantial, Bully Brew has a full line of bagels, grilled Panini sandwiches, bagel sandwiches, and breakfast burritos. Regardless of the reason for stopping, just one visit and you’ll be hooked. View more North Dakota Bakeries and Pastry Shops.